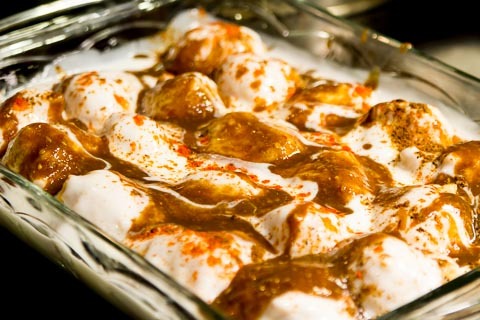 Dahi Bada is an Indian recipe is made out of white lentils. These are prepared by frying them and then topping them off with spices and chutneys. Immerse the lentils in water for at least 3 hours. Wash the lentils and remove all water. Add lentils, ginger, and chillis to a food processor. Blend. Add ¼ cup of water. Add salt to taste. Blend again. Remove from food processor into a large bowl. Mix by hand to make the mix smoother. Add oil to a deep pan for frying. Let oil warm up for about 5-7 minutes. Test oil first by adding a very small ball of the blended mix. If the ready is oil, the dough will rise to the top of the oil. If the dough does not rise to the top, then the oil is not ready. Process once oil is ready. Have a bowl of water on the side to dip fingers in so that the mix does not stick to your fingers. Make small balls and drop them into the frying oil. Repeat until all mix is done. Fry for about 8-10 minutes until balls turns golden brown and cooked thoroughly on the inside. Add hot water to a large bowl. Then take the cooked lentil balls from the frying pan and add them to the hot water. This will make them soft. Do not use cold water for this step. Let them soak for about an hour. Take the plain yogurt and add water to it. Then beat the yogurt like an egg to make it thinner. You can use as much or as little water as you like. Take each lentil ball and squeeze out all excess water. Repeat for all the lentil balls. Top off lentil balls with yogurt. Add red chili powder, roasted cumin seeds, and dates chutney. Enjoy Dahi Bada as an appetizer or snack.